Between moving house and two trips, it's been a pretty hectic month but our new little home is practically all sorted. From feeling like we've been living amongst boxes of stuff for such a long time, it's so nice to finally have the whole place pretty much tidy. The only room left to work on really is the office space. And armed with Pinterest boards and saved Instagram posts, I am so ready to start tackling it! Since I work from home a lot, and Mihai wants a quiet space to study, we thought it best to create a neutral space where we can both take our laptops and work. However, the space in question was originally a single room. Meaning that it's pretty small and so we're going to have to get a little creative with how we fit it out. Having become something of an expert on small spaces, (after spending the last 27 years in a box room), I think the key to making the room feel bigger, is finding the right furniture. 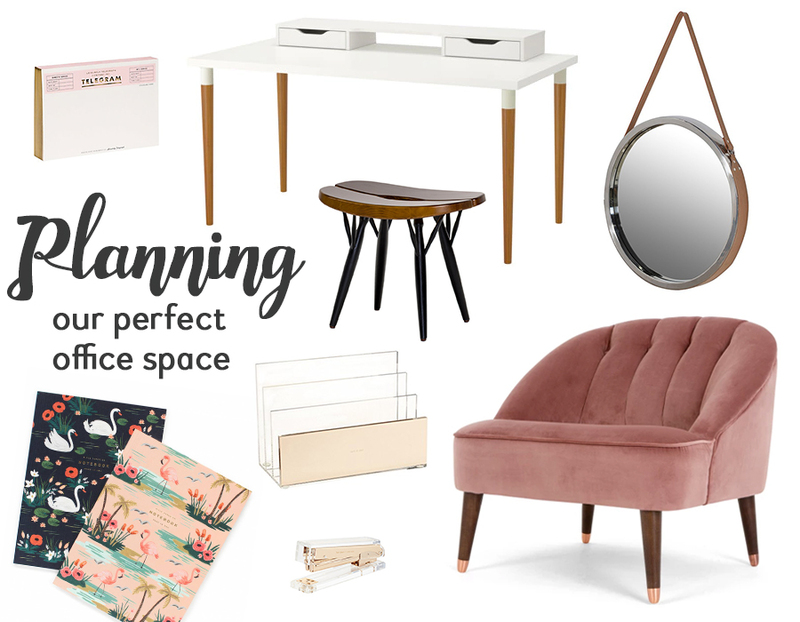 Find pieces that make the most of the space without it feeling cluttered and you're on to a winner! I'm thinking a simple desk: nothing too big or bulky that will dominate the room. Some kind of cute stool that could double as chair or a little side table for magazines and tall storage or shelving that won't eat up too much floor space. Maybe frame some nice prints and hang a cute mirror. And maybe, if we have room, some kind of statement chair. Because an office needs some kind of relaxation / break out area, right? Seriously though, I'm trying to think of any excuse I can for that pink velvet dream... Space permitting, of course.